Litter-Robot Open-Air Review – Will the cats use it? – Ginger Kitties Four – Celebrating the Kitties We Love! Automated Pet Care Products sent us their latest model, the Open-Air. The kitties love their Litter-Robot II bubble unit, but it is kinda a tight fit for Zeus. A few months ago Zeus left me a present outside of the Litter-Robot II indicating his displeasure squeezing into it. He has to exit to turn around and go back in to bury his treasure. The Open-Air model has so many cool features. The globe is very roomy, even for an 18+ pound cat like Zeus. He is so happy now and uses the Open-Air model like clock work. It is very quiet; I’ve heard can openers that are louder than it. The step below the opening has a flexible plastic mat that is a catch-all for litter and liquids. The mat simply lifts out for cleaning and has a slot below it to contain liquids. As you can see in the photo to the left, the controls are placed to the side and not underneath the opening as on the LRII. All the kitties love it, even tiny Athena. She just doesn’t like flash photography while doing her business, such cattitude on her tiny face. Another nice feature is the bonnet that encloses the globe. The globe is on a track that keeps it turning smoothly. In the photo to the left, you can see a couple small plastic knobs attached to the bonnet at 11 and 1 which helps to keep the globe aligned properly while turning. One of the best features is the Drawer Full Indicator. On the LRII if you forget to empty the drawer once it is full, the waste continues to fill up until it comes in contact with the globe. As the globe turns on the LRII, waste is smeared on the globe. With the Open-Air model this won’t be a problem as the Drawer Full Indicator will prevent the globe from turning. You will know when the drawer is full because the control panel will display a blue flashing light. On the Open-Air model the cat sensor has been moved from the step to the globe. 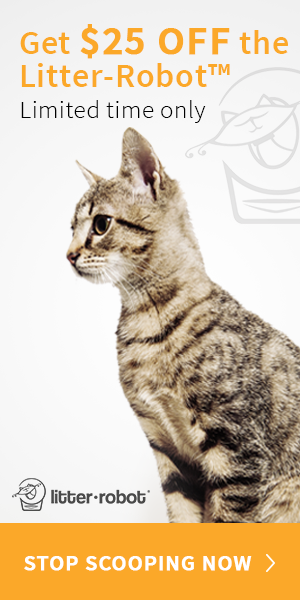 The sensor is weight sensitive and detects cats weighing five pounds or more. This sensor activates the cleaning cycle after a predetermined amount of time. Once a cat leaves the globe, the count down begins, but will reset if a cat enters the globe. Another nice feature of the Open-Air is a choice of three time settings: 3 minutes; 7 minutes; and 15 minutes. Another really cool feature is the Automatic Night Light. If you don’t want it on, the night light can be turned off. The light turns on once it detects no source of ambient light. I have been sitting in the dark at the computer when suddenly I heard a very faint sound. I was able to see that the sound was the Open Air starting a cleaning cycle only because of the night light. Last night this happened three times in a row over the course of an hour as different cats used it. One other feature some people will enjoy is the 8 hour sleep mode. This allows one to prevent the Open-Air from starting a cleaning cycle where the sound of it may wake up light sleepers. The start of the 8 hour period is determined when the mode was initially set. The sleep mode will activate every 24 hours so setting it right before bed time will ensure a quiet night every night. We are very happy and satisfied with our Litter-Robot Open-Air. We highly recommend it to anyone who hates scooping and their cats who hate using a dirty litter box. The savings in litter costs alone makes it worth the initial purchase price. so you don’t miss any promotions from Litter Robot. Click below to watch our video review of the Open-Air model.